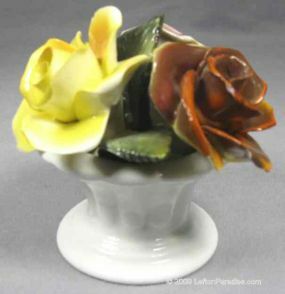 Bone China Vase with Roses Discounts Apply ! A bone china vase with three bone china roses and leaves. Flowers are not removable. Made in England. The piece is 2¾ inches tall and has the Lefton Bone China mark. There are a couple of tiny flea-bites (chips) to some rose petals.